These automatic pizza boxes are a perfect way to deliver the tastefully prepared pizzas to your customers safely. 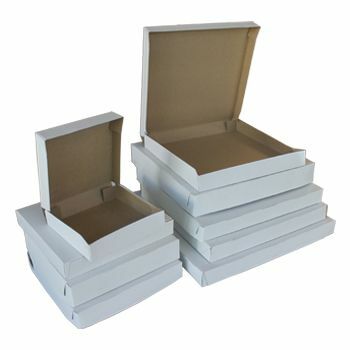 Custom prints on the smooth simple allows your business to take credit for these considerate boxes. Pizza may just be the best food out there, and these automatic pizza boxes help ensure that the pizza reaches the customers safely. 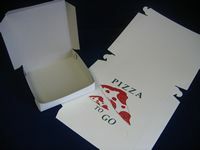 These pizza boxes can be bought in plain white or you can have them custom printed with your branding. These automatic pizza boxes are made of 100% recycled material. They have Kraft interiors and are white on the outside. These automatic pizza boxes are available in 5 different dimensions so there is one that is perfect for every pizza you have.